A few weekends ago my adventurous sister and I decided that we wanted to try another seafood restaurant. One seafood restaurant just north of downtown had been spoken of highly in reviews, so we opted to see if it was worthy of the high praise. Upon entry, it was clear that the restaurant was a great place to go for having drinks. However, the sazerac that I had left me wondering if I was missing something. And after a forced meal of dishes that looked appetizing, but weren’t, my sister and I were on the hunt for a Plan B. She had mentioned a neighbouring restaurant not far from the seafood restaurant, so we were off to overcompensate for the hunger pains that were overtaking us. We went to Sable at 505 N. State Street in Hotel Palomar. Crowded at the bar with a large seating area for those who want to have a dining experience, Sable seemed like it would be an ideal Plan B. It was. We took a seat in the dining area without having to wait and the server was over to the table to explain the menu, make note of some specials, and offer suggestions. With it being cold outside, my sister started with an Easy Livin’ drink — her way of projecting herself onto a sunny beach. I had an alcoholic beverage that was more like a hot toddy with a nice amount of brandy, a hint of chocolate, some bitters, and bliss. 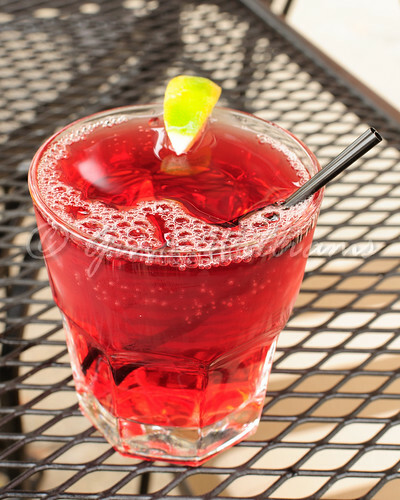 I really don’t know exactly what was in the concoction, but I will say that it was a thousand miles better than the sazerac I’d had earlier that I swear was water with a splash of whiskey and absinthe. Understanding that we had arrived late, we settled on two items that we knew would do well to ease the growling in our bellies and replace our scowls with smiles. 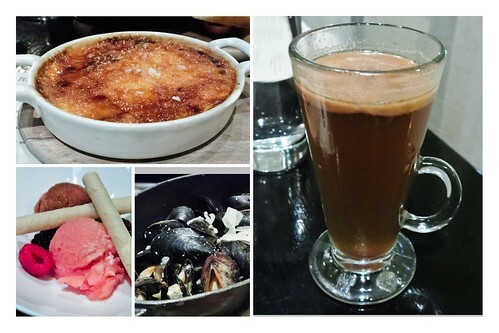 There were creamed corn brulee and mussels. Creamed corn is an appetizing dish all on its own. Having a brulee crust atop of it did not detract from the dish. Actually, this was one item that I have been ranting and raving about since I went to Sable. The other was a huge bowl of mussels in a white wine sauce with garlic and garlic toast on the side. Hello, mussels. Good bye, Dracula. The last time we recalled having mussels as delicious as the ones we had at Sable was when we had gone to Autre Monde in Berwyn, Illinois. 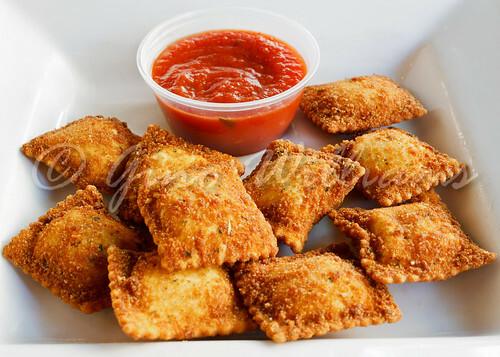 Those little morsels were greeted with insatiable appetites and gnashing teeth. Not to let any of the sauce go to waste, we soaked the toast in the sauce and devoured it to complete satisfaction. 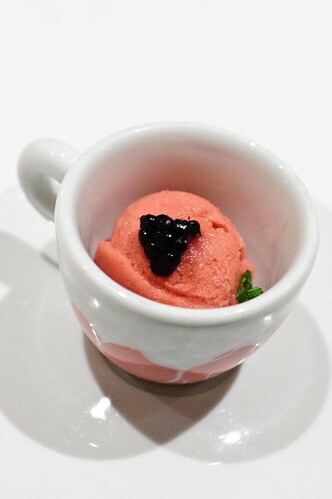 For our finale, we ordered sorbet — blood orange and blackberry basil. 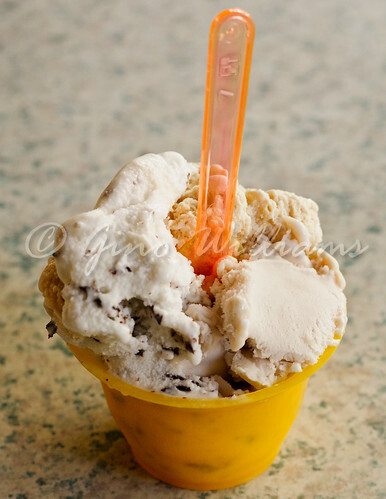 These two scoops were what dreams of made of. Accompanied with berries and dainty cookie crisps, I read my sister’s mind when she was saying to herself, “This is where we should have come from the start.” Sable was an excellent contingency plan. It may be the weekends or it may be every evening, but the bar section of Sable fills up quickly with a motley crew of lively patrons. Most restaurants in Chicago accept reservations and Sable may be a participating restaurant that does the same. Considering how good the food is for a hotel restaurant, I understand the crowd. What we had, albeit not a lot for our visit, was fine dining without fine dining prices. 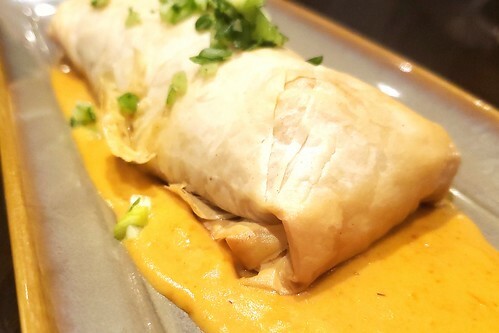 Those who are looking for a great restaurant with perfect drinks and outstanding food, make Sable your first choice if you are in the River North and Near North area of downtown. You will not be disappointed. Recently, I returned to Oceanique, at 505 Main Street in Evanston, Illinois. With this recent visit being my fourth one since February, that says a lot. So, I will not give another review since I gave a raving review already. 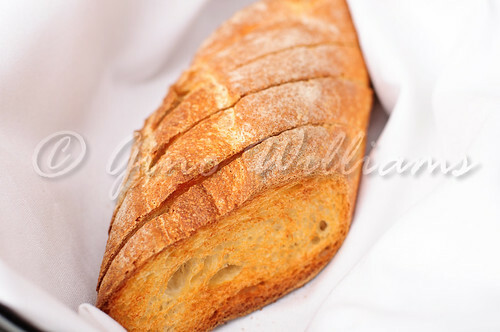 What I will do in this post is focus on an aspect of photographing food I have encountered in very difficult settings consisting of extremely low lighting and I will show you a few “before” and “after” shots I captured during my latest dining experience for reference. I shot the photos in a setting with dark and conflicting lighting. There was a flicker in the lights, undetectable with the naked eye, but noticeable when looking at compositions through the viewfinder of the camera. Adding to the lighting were brown walls and white tablecloths that created an orange tint to the photos. 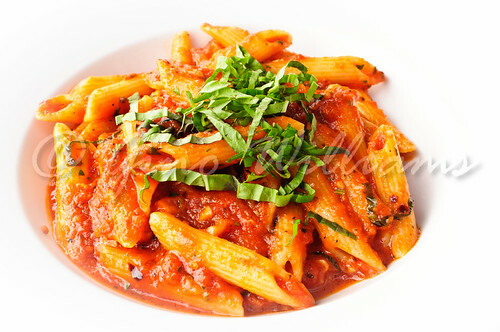 Once you click on the photos and see them enlarged, you will notice how the lighting warmed the photos and overpowered the colours in some of the menu items. Using the “before” photo of Escargot, Salad, Duck Confit for reference, pay attention to the base of the wine glass in the upper left-hand corner of the photo. Put a footnote there, for I will mention that photo again later. Before explaining how I transformed the shots of my recent dining excursion to “after” compositions, here are some logistics. I have four digital cameras that I use interchangeably when capturing impressions of food for blogging. There are the Nikon D90, Canon Rebel XS, Canon Rebel XT, and a Nikon 1 J1. The Nikon 1 J1 has become my constant companion. It is compact enough that I can manage it and have room on the table when I’m not using it. I can switch lenses on it much like I do with my prosumer cameras. Always cognizant of the restaurants’ staff and other diners, I never use flash on my cameras. I photograph with the cameras in manual mode so that I can allow in enough light and not have bursts of light distracting anyone. If lighting is too dim and I think there could be the possibility for blurred photos, I use a small tripod and a remote to the camera. Depending on how much food I order or how long I am at a restaurant, the zealot in me will photograph hundreds of photos from various angles before the server places the bill on the table. As you can see from the above gallery, I do post production on the photos. 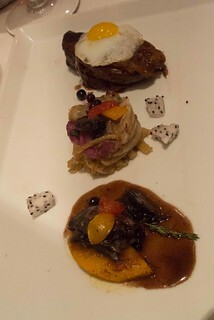 Referencing the photo of Escargot, Salad, Duck Confit, note that the glass that was originally in the upper left-hand corner of the photo is not in the final composition. 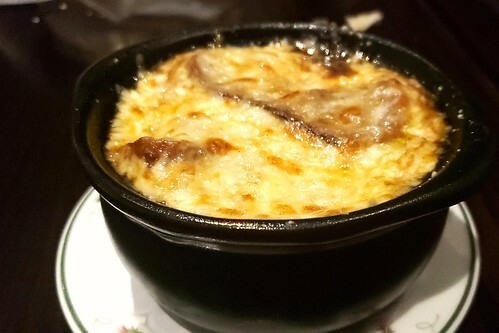 I cropped the photo to remove the glass and made a minor perspective correction so that viewers zoom in on the food only. I applied white balance correction to remove the orange colouring cast the in the “before” shots. 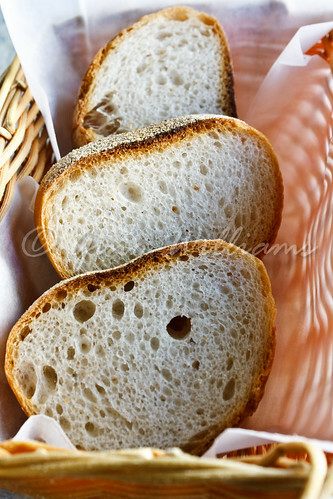 Doing this makes the natural colours of the food pop without any need for colour enhancements. My tools of choice for post production editing are Adobe Lightroom, Adobe Photoshop Elements, and Coral Paint Shop Pro. Unlike graphics artists who turn actors and actresses into alabaster dolls, I avoid manipulating food photos to the point of practically recreating a mockery of the original composition. Yes, I correct colour casts, remove artifacts, and crop to fill the frame. Still, I prefer not to detract from the original composition unnecessarily. Not everyone who photographs food will be as overzealous with their photography as I am. In many cases, untouched photos do a better job of putting viewers at the table. I have often thought of my photos as looking staged. I look at past photos I captured years ago when I started blogging. They were some cool shots that came to life thanks to my point-and-shoot Konika-Minolta. My hobby is an addiction and there is no way that I want to let you see my passion in an unappetizing way. Wait, was that a bad pun? If only I could edit it the way that I do my photographs. 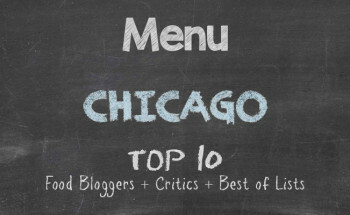 Earlier in February, Chicago hosted what has become the annual Restaurant Week. Many restaurants participated, all pandering to a wide range of tastes: American, comfort, ethnic, barbecue, street, exotic, and more. Thanks to frigid temperatures and work-related travel, I was only to take in about three restaurants. And even then, I opted to have my degustation from their menus rather than partaking of the offering from the Restaurant Week menu. I was not dissatisfied, to say the least. 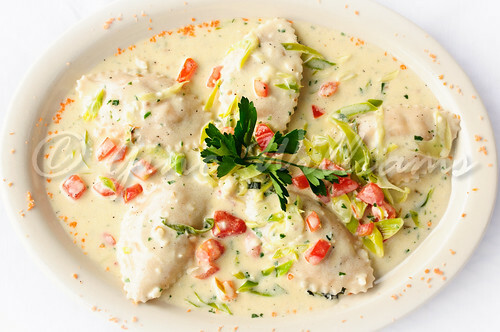 Now, one of the restaurants on the list was Oceanique at 505 Main Street in Evanston, Illinois. Seafood with a French influence, something more to the liking of Southern France along the coast. With an outstanding selection of seafood for the pescatarian in me, I paired the menu choices with a flight of mojitos. Flights are not on their menu, so Oceanique got big ups from me when the bartender complied and came up with a flight that won me over tenfold. Not having my camera then, it was necessary for me to return for a proper blog. Much to my surprise, Chicago was in the throes of Chef’s Week during my return. 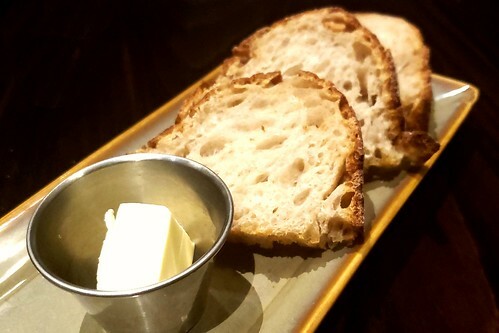 I was in a mood to be truly experimental, so I had made up my mind that I was going to have another degustation and entrust the server and bartender to create an experience that would make my visit worthier than the first visit. Having secured a seat in the dining area across from the bar, taken the white balance for my photos and video, and happy that I was seated nowhere near anyone, I started with a l’amuse of Icelandic Arctic char ceviche wrapped in leek with a cilantro oil essence. It was served with cucumber, fresh seaweed, and crispy potato. By the time I had finished the l’amuse, a couple arrived and rather than sitting in the main dining area, they chose to sit at the table IMMEDIATELY NEXT TO ME. For my first course, I had wild Maine lobster consomme. At most seafood restaurants, there is almost a guarantee of having a chowder or some bisque served. 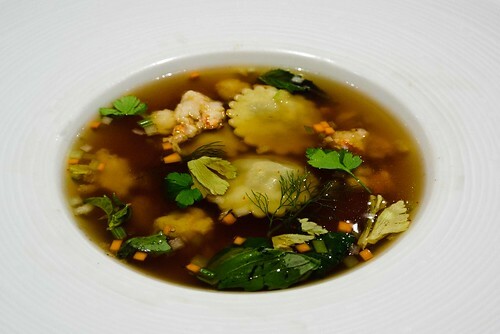 Oceanique deviates from the norm with ravioli of chantarelles, chunks of lobster, cilantro, and chopped carrots in a clear broth. Outstanding! 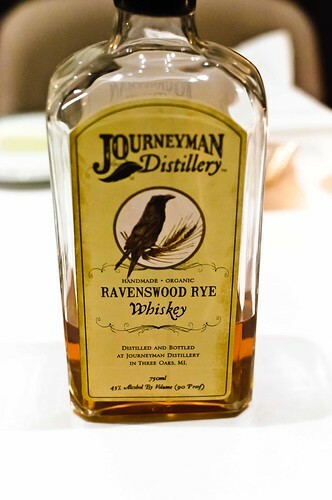 Because I was being daring for what I wanted in my beverage selection, I had requested a flight of whiskey cocktails for my refined palate. 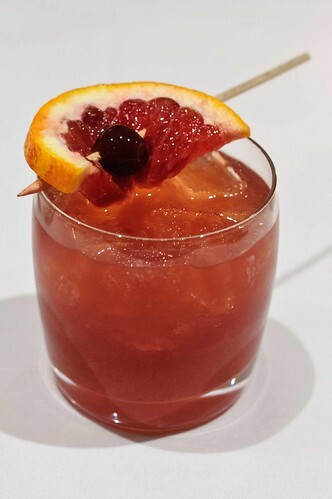 The first, which was served with the consomme, was a slight twist on the old-fashioned — a blood orange old-fashioned. Blood orange, cherries, rye whiskey, and Angostura Bitters make for a rather refreshing whiskey cocktail, one that has made the plain old-fashioned fade from my request list. A few minutes passed and then there was a second l’amuse to come to the table. 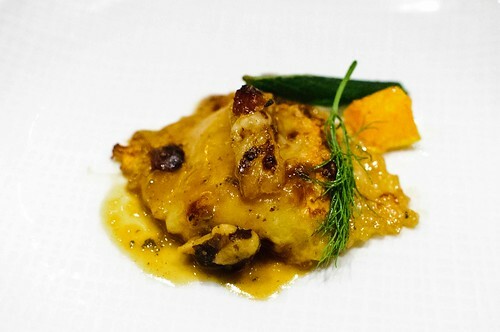 This one was a butternut ravioli prosciutto with parmesan, and crispy sage, served in a brown butter reduction. Considering this was only a palate cleanser interlude, I was in my Food Magazine mode capturing the sight of it before devouring it slowly. Only in my dining experiences abroad have I had a l’amuse interspersed throughout dinner. 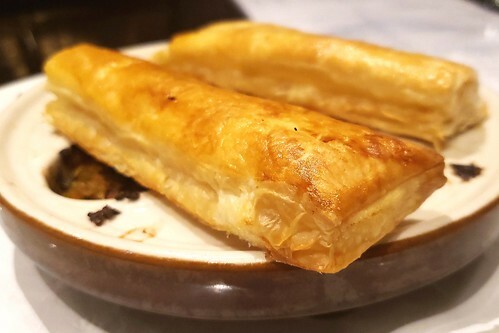 Even at many of the high-end restaurants in Chicago, New York City, San Francisco, and Los Angeles, there may be one given at the onset of the meal. Oceanique again smashes the norm. Then again, it may have been because I was creative with ordering a flight of whiskey cocktails and the chef did not want me stumbling about after departing the restaurant. The second course was a salad. One thing I have noticed in my restaurant excursions is that many are fans of beets. 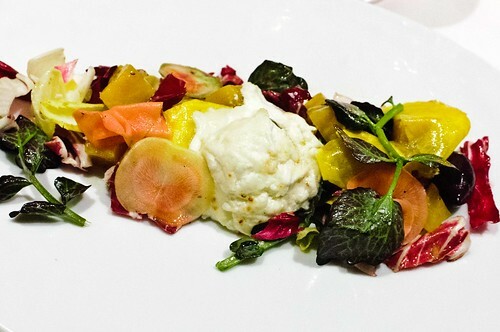 Oceanique has a beet salad in a mild vinaigrette that comes to life with a dollop of goat cheese. If ever I were to resort to a diet of rabbit food only, recipes like the one in the beet salad creation would become a staple in my salad recipes. Anyone who favours Thousand Island, ranch, or blue cheese dressing on their salad, should try the beet salad at Oceanique. 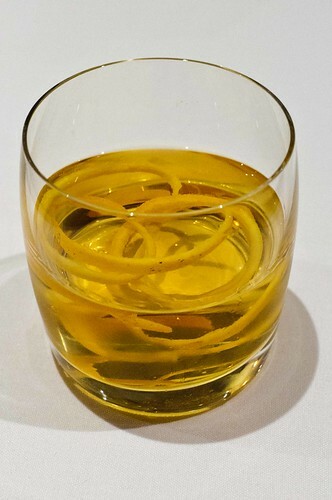 And the whiskey cocktail that accompanied the salad was a Chartreuse Sazerac. This was another masterpiece, one of whiskey, Peychaud Bitters, and simple syrup with a lemon twist. The second course was absolute tops. By the time I had completed the second course, another couple had come in and sat at the table on the other side of me. Plenty of room in the main dining area and lots of tables in the room where I was sitting and they needed to sit near and call some friends, who I gathered was supposed to join them. I sighed and after looking at some of the photos and video that I had captured, the third l’amuse arrived. 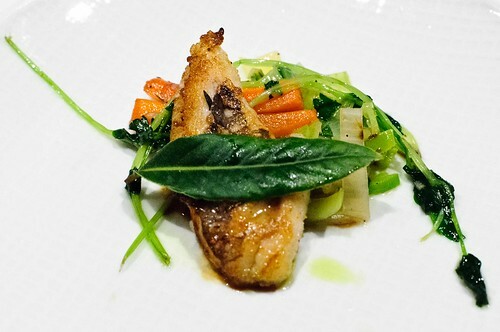 This was wild Maine skate with leeks and carrots in a white wine reduction. 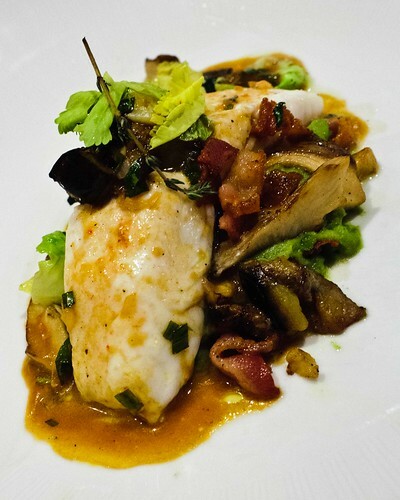 Skate has a texture that is reminiscent of sea bass but slightly silkier. It may be different to some palates, but the flavour overpowers the feel of sinking your teeth through a flavoured cloud. If I could describe how love tastes, the wild Maine skate would be my example. Up to this point, everything had been a winner. 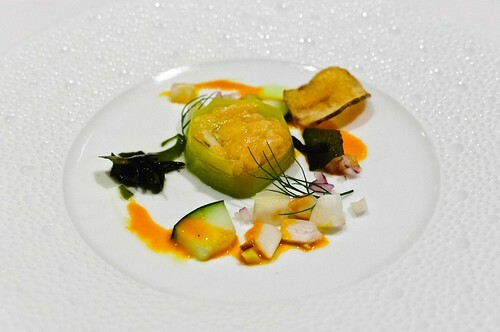 The third course is where I began to wonder why Oceanique was not on the candidate list for a Michelin star. Atlantic char served over mushrooms and puréed split green peas in a savoury reduction were all I needed to start my petition to Michelin to do the correct thing by Oceanique. I had forgotten to mention that I am not a fan of pork in my diet, so the dish came with a few bacon pieces that I moved to the side. However, the bloom in the taste was a true winner for the seafood lover in me. I had not enough compliments for the chef for such a divine course. 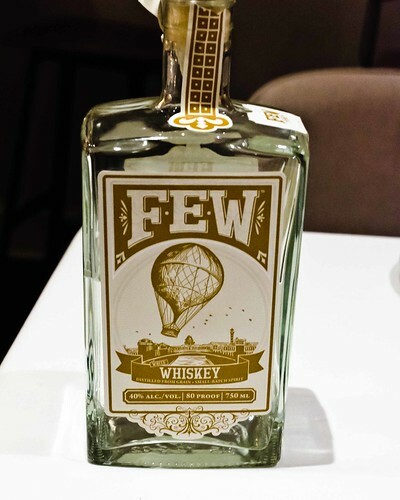 And to the bartender, the Evanstonian that he mixed has now become my favourite whiskey cocktail. 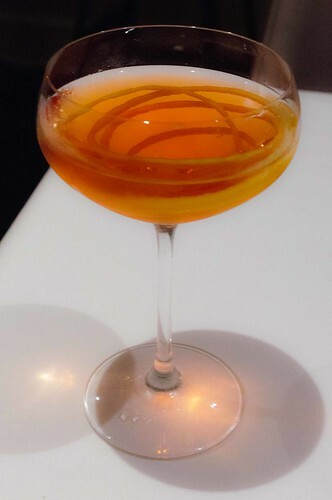 Made with Few white whiskey from an Evanston-based distillery, orange bitters, sweet vermouth, and a splash of Creole Shrubb rum, this cocktail was silky on the tongue and without a bite at the back of the throat. It was this third course that will certainly have Oceanique at the top of my list for the Top 10 restaurant excursions for 2014. And I may have to create a list of Top 10 bartender stations for the year also and add Oceanique to the number one spot in advance. The dessert course was for the chocolate fanatic in me — and in all the chocolate lovers who were not at Oceanique with me. 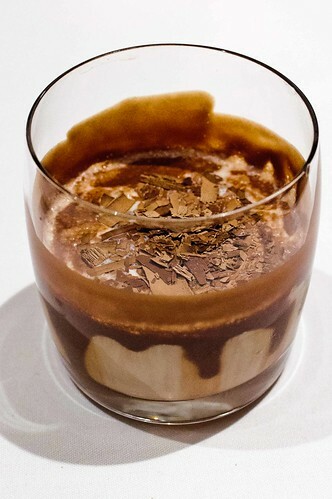 The pot de creme is already a part of every chocoholic’s fever dream. 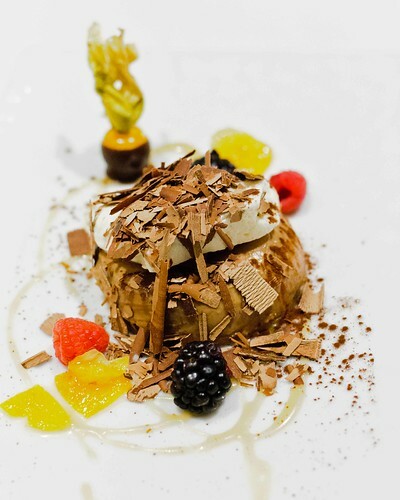 This delight was served with blackberries, raspberries, passionfruit, and shavings of Godiva chocolate. You have to enjoy this dessert slowly. To gorge it down quickly would be a crime. Because I was supposed to abstain from desserts until my birthday in April, I initially had a bit of guilt. But I have been good in fending off my dessert desires, so I allowed myself a moment of weakness. To make matters even more wicked, the whiskey chocolate martini was enough for me to be okay with burning in hell. 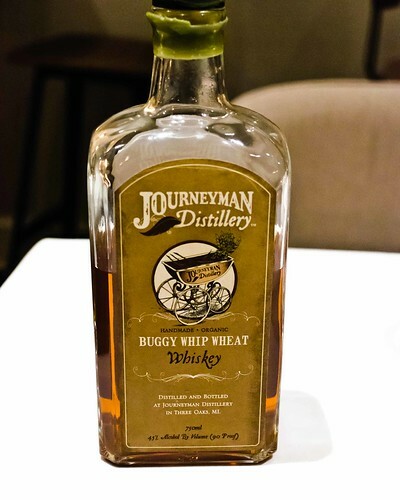 Journeyman wheat whiskey, Godiva white liqueur, half and half, and a splash of Kahlua, and the second woman at the table next to me was clutching her “invisible” pearls and mumbling, “Oh my,” while the men were in a trance. One thing that my return visit to Oceanique has taught me is that it would be cliché and erroneous to say that if you have gone to one seafood restaurant, you have gone to all of them. The quality of the output from the kitchen is simply divine. Some of the offerings are to be appreciated by a finer palate, though. The term mixologist has been bandied about rather frequently as of late and having discovered that it’s used to reference bartenders, not disc jockeys and emcees, the mixologist at Oceanique deserves an award. 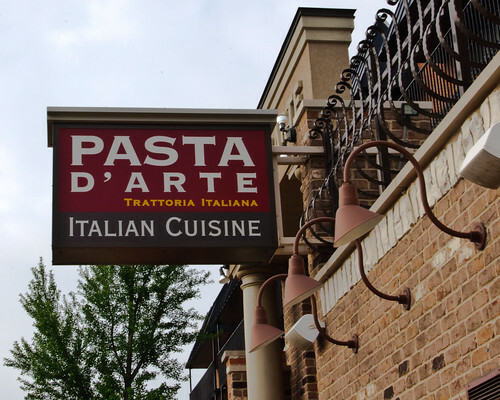 The restaurant is not in the immediate downtown section of Evanston, which may make some express surprise when they discover where it is located. 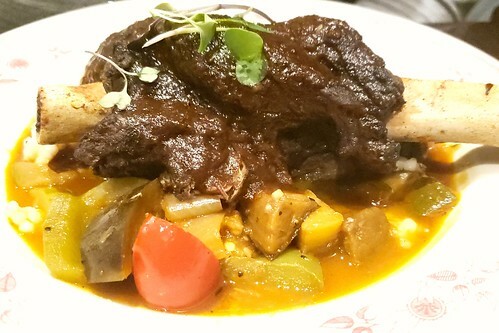 The prices are high, as the restaurant caters to high-end and fine dining. With there being a French influence, anything that purports to be French and comes at a cheap price should warrant a rapid dash towards the hills. And as my taxi driver woke me from my snoring on my way home from the restaurant, I paid my fare and spoke in a mock Southern accent: I am in love with Oceanique, I do declare. I have often wondered what it would be like to have camera appeal such that I could do interviews of chefs, cooks, managers, and owners of restaurants. Alas, I don’t. But I do have a bit of creativity and I think I may start to bring a bit of that to Chicago Alphabet Soup. While I am abroad for the month of September, I may ponder some ideas to put into video. The whole photography aspect of the food journal works well and it’s actually better since I really, really needed to learn how to use the expensive cameras that I had bought. There was absolutely no reason to have paid thousands of dollars for equipment that I used in automatic mode only. I may not be a “Food Magazine” photographer, but I am not the point-and-click smiley face that I was when I first started penning Chicago Alphabet Soup. Well, the video below is one that I did at home. This is me pretending to have no idea what I want to eat for dinner and having such a magical touch, I create a dish on the fly. If only that could happen in real life. Wishful thinking will get me nowhere. However, a camera with video features and editing software will get me a humorous clip or two to post of my food adventures. The dish that I create in this video is an Algerian dish of chicken kabob over potatoes, mushrooms, and onions. 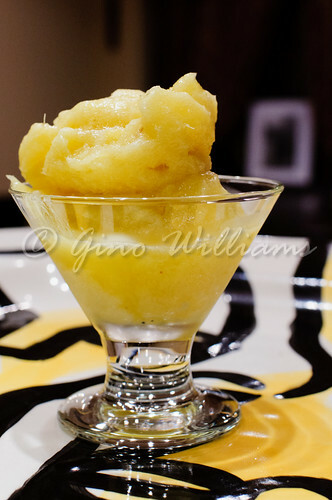 One other thing I did recently was try my hand at making a pineapple sorbet. Ice cream, gelato, and frozen custard have desserts that I have had much success making — aside from baking cakes and cookies. A friend, who is starting to introduce more vegan recipes into her diet, had cooked a spaghetti squash arrabbiata and I brought an almond vegan cake and pineapple sorbet. Now, the first time baking or making a dessert always gives me the willies, so imagine my surprise when the cake and the sorbet had come out better than expected. 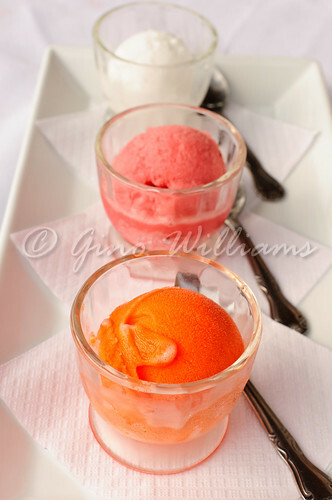 If it were not for me getting ready to go away for holiday, I would have made more sorbet. I had pondered a ginger mango, lemon, or pineapple again. I will have to save up those ideas for my return. In the meantime, enjoy my teaser video and photo of frozen experimentation from my freezer. And if you start hearing voices in your head, it may not be voices, but your growling belly. Make a reservation at one of the restaurants I’ve posted and take your appetite to indulge something from someone’s kitchen. During my high school days, there was a singer by the name of Cheryl Lynn. You may remember her songs “Got to Be Real,” “Shake It Up Tonight,” and “Star Love.” Here we had a woman with the pipes of an angel and who could stand flat-footed at the microphone and belt out a song without any studio magic — or that awful auto-tune phenomenon — to cover up poor vocal talents. And she did not shake her rump like she was performing in a Bollywood video. I loved the songs that Cheryl Lynn graced the airwaves with. But there was one song in particular that I played endlessly when I had first heard it. “Encore.” Your good loving deserves an encore, she would sing. And when I find myself returning to certain restaurants, I am reminded of how much “Encore” applies and I all but bring my own microphone and perform for others at the restaurants. Earlier during the summer I went to a relatively new restaurant in Oak Park, Illinois, named Seven Ocean. 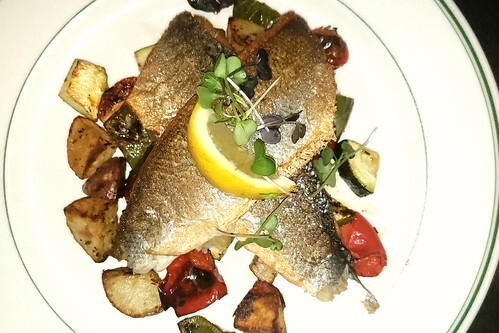 Sitting at 122 N. Marion Street in the cobblestone stretch among boutiques and cafes, I was thoroughly impressed with the dining experience and the service I had received. Granted I had a prix fixe meal along with a wine pairing, I walked away feeling that the summer menu was absolutely brilliant and the chef will make a mark in the culinary world if the restaurant continues to perform with an air of high calibre affectation. Now that the temperatures had started to become consistently chilly, that being autumn was in the air, I wondered if Seven Ocean was one of those restaurants that changed their menus to be reflective of the seasons. The answer, in short, was yes and there was, of course, the tune in my head of Cheryl Lynn singing my favourite song. 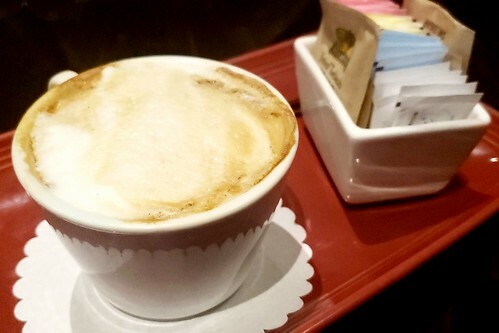 While having a quick stroll through Oak Park and having stopped in at a nearby dessert shop for a quick cup of coffee, I sauntered over to Seven Ocean and allowed the magnet to pull me on in completely. Although there were no comfy sofas and chaises placed strategically throughout the restaurant, there was the sound of boutique jazz playing in the background that made everything that more inviting. I still think that the design was done per a man. The straight lines and muted olive earth tones were nothing akin to flash, flair, reds, and curves. The aesthetics of the restaurant are too stiff, and that may be why the food is the antithesis of the cosmetics of the restaurant. Talk about a well-placed balance. Because I had sampled the summer fare from the prix fixe menu, I settled for creating my own menu selection. Often I like to request recommendations from the server as to what he or she would prefer. That works brilliantly at times, but it is a bit of a presumptuous thought that the servers know exactly what I want and will suggest bill of fare items without me wincing. Many times, I do believe they have been so worked to near spiritual defeat during their work hours that they appreciate someone requesting his or her own meal. There are moments when you can hear the sigh from servers as though air is being released from a deflating tire when you lead in with, “What would you recommend?” In restaurants where the faces change rather quickly, it helps knowing what you want before the server approaches the table to take the order. 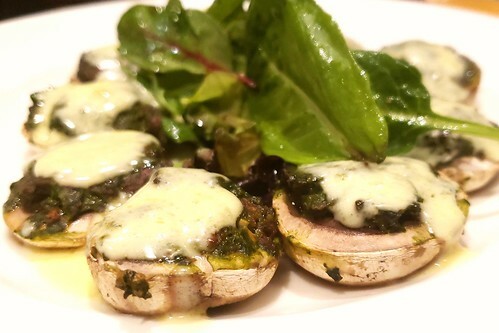 Having witnessed some fed-up servers make recommendations in a manner fitting for a saucy comedy club sketch, I showed a bit of a command for what I think is best for my palate — I should be an expert on my own taste. My approach to the meal was to delight a multi-course meal with a pescatarian fare. I started with lobster stuffed gyoza. 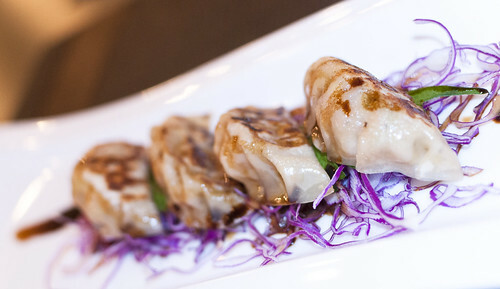 Japanese style gyozas filled with lobster, sitting atop shiso leaves and red cabbage, and glazed with a ponzu sauce was absolutely a great choice for a starter. The gyozas gave an Asian influence to the appetizer and perhaps had there been only one gyoza and I was at an Italian trattoria, I could have called it a l’amuse bouche. Alas, there was nothing left of the gyozas after a few slow minutes of me slicing, forking, and indulging. 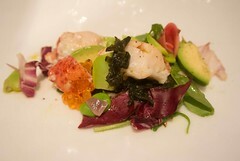 A few minutes passed and then there was the second course, a seaweed salad. 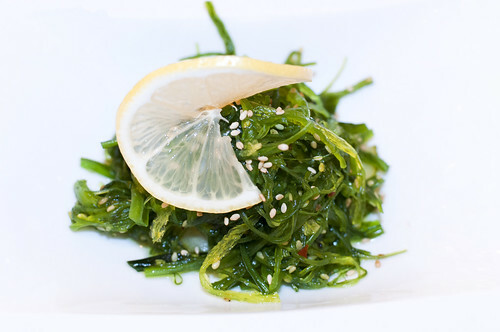 Seaweed may not look all that appetizing when you are snorkelling, but Japanese seaweed, cucumber, sesame, and vinegar dressing never tasted so divine. 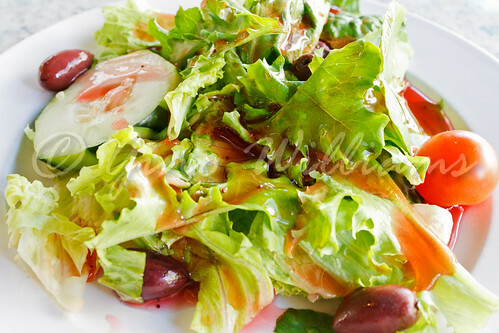 The seaweed had the texture of well-cooked, thin green beans and the vinegar dressing entertained a citrus flavouring that would leave most questioning whether there was any vinegar in the dressing at all. 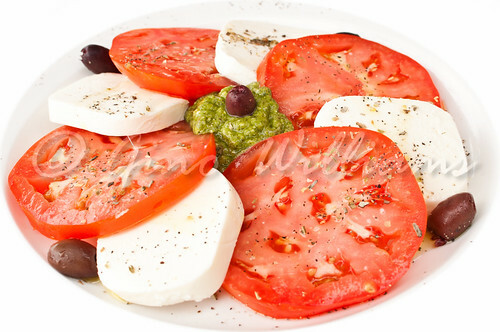 There is something to be said for a salad looking so bland having such a bloom to its taste. Again, here was another course that had an Asian influence to it that did not fail. In keeping with a Thai appeal, there was coconut soup. 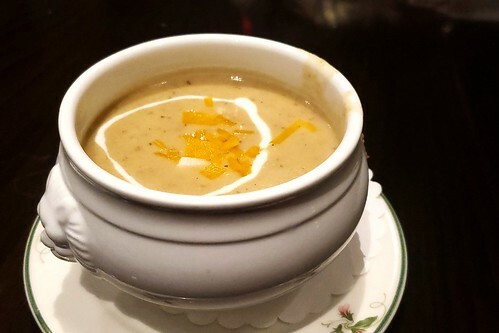 I was already quite enthralled with the first two courses, but the coconut soup as the autumn soup went over so well that I did not miss anything in the pumpkin or yam family doctored up with a hint of cinnamon, a dash or nutmeg, or a touch of allspice. 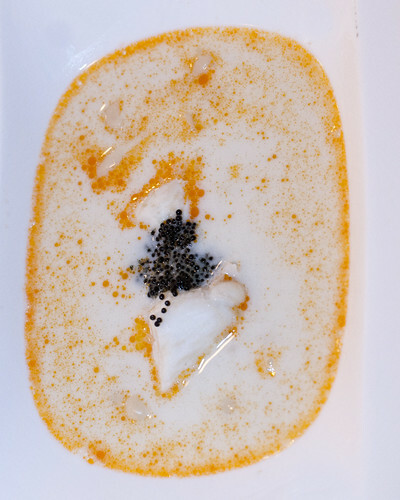 There were crab meat, shimeji mushrooms, and tobiko that arrive in a bowl and then covered with steamed coconut milk. 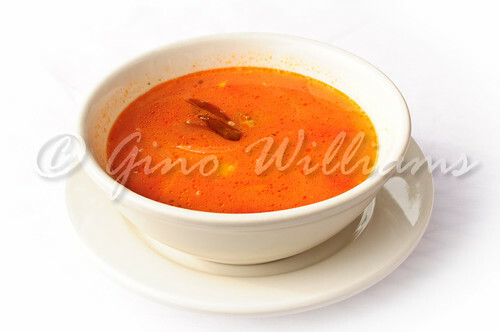 If you have ever been to a Thai restaurant, I guess I could relate the soup to tom kha. You may have recognized from my many posts on Thai restaurants where I have been that I have a very strong preference for foods influenced by Thai culture. The pairing of the herbs and spices in the recipes never fall short of works of culinary care, evident in the high notes of flavours in the dishes served. That same notion became apparent after a whiff of the coconut soup at Seven Ocean, well before the first sip. Also with the soup, I had a Sauvignon Blanc from a vineyard in New Zealand. Neither dry nor sweet, there was a hint of a floral note that made the wine a superb complement with the soup. I could not have offered a better wine suggestion and this was where I deferred to my server for an ideal selection of wine to accompany the meal. By the time I was finished with the soup, I had convinced myself that nothing could possibly go wrong. Then the prawn yakisoba over Asian cabbage accented with soba sauce and fish flake that moved its own from the rising heat, came to the table. I had started singing “Encore” by Cheryl Lynn off key, making up words for the lyrics that I could not remember, humming the song in other parts, doing a little dance with my eyes closed, and then opening my eyes to see that some other customers and my server were staring at me. 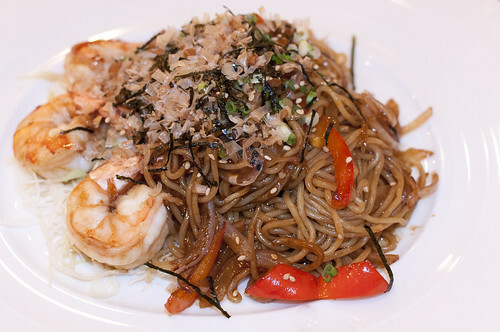 The prawn yakisoba was absolutely fantastic, but I had to deal with my embarrassment however I saw fit. 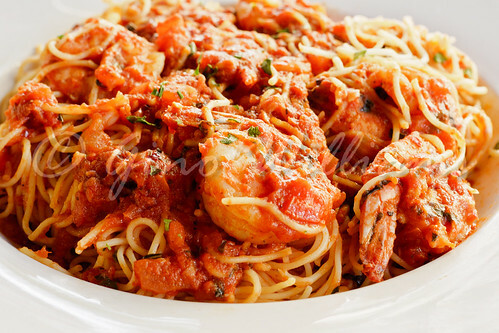 It was just that in the meantime, the succulent, well-seasoned shrimp had a wow factor along with the noodles in the rich sauce. Another glass of the Sauvignon Blanc and there was no argument that the prawn yakisoba became, at that moment, my all-time favourite autumn dish. Realizing that I had already made a fool of myself with my singing and dancing, and I could not go back in time to catch myself, I began humming again. This time, I kept it low enough that no one could hear me. 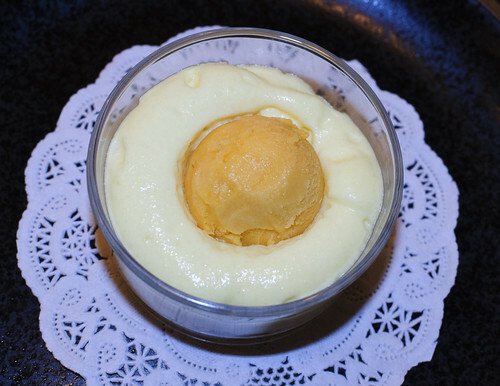 When I first went to Seven Ocean, I had a dessert of sticky rice with mango and crème fraiche. 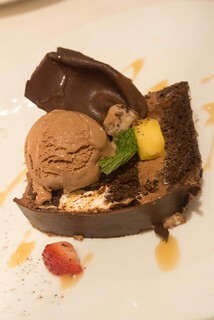 During the evening of my most recent jaunt, I had a different take on the dessert. 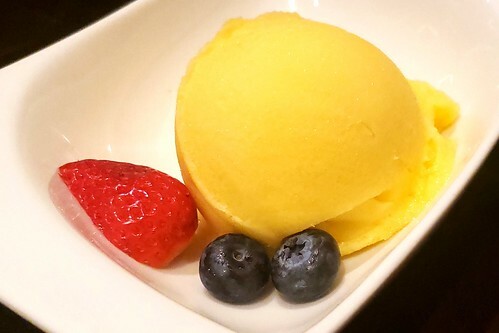 There was sticky rice but topped with a mango sorbet and then there was a moat of light mango soufflé around the scoop of sorbet. Brilliant, I thought to myself, as I enjoyed the magic of each spoonful. 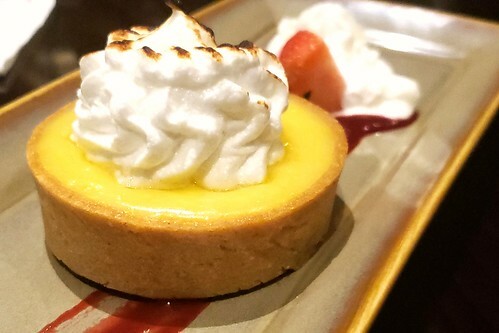 When the dessert was mentioned, I initially thought that I was going to have the same dessert I had during my first visit. Part of my misunderstanding was because I was still bandying the song “Encore” around in my mind while the server was telling me about the dessert. Oh was I glad I decided to have it instead of coffee. If someone were to ask me to define love, I would tell them to got to Seven Ocean and request the autumn version of dessert. 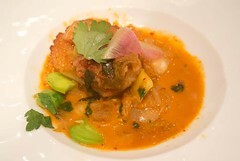 So, after all was done, I was very happy that I had gone to Seven Ocean for a sampling of the autumn menu. It was not only a meal, but it was an experience. Like all of the restaurants where I have returned for more than one visit, I was again taken in to the point where I made plans to return during the month of January or February to see what their winter menu will have for those who appreciate fine dining and something with an unconventional twist. Because Seven Ocean is up-scale, the price is reflective accordingly. The restaurant is not a showcase in fanfare or grandstanding. Simply put, the service and dining are smashing. Yes, Seven Ocean, your good loving deserves an encore.